Brooklyn's Jones Street Station (formerly Jones Street Boys) show off their five-part harmony on their cover of John Hartford's ode to city life, 'Tall Buildings'. I never get tired of listening to this. And Hartford's lyrics are fantastic. I hadn't planned on posting the John Hartford version of this song, hell I didn't even know this was a cover until after I'd started this post, but I was able to find a live performance of this song by its original author. Now I'm looking forward to digging into the Hartford catalog. 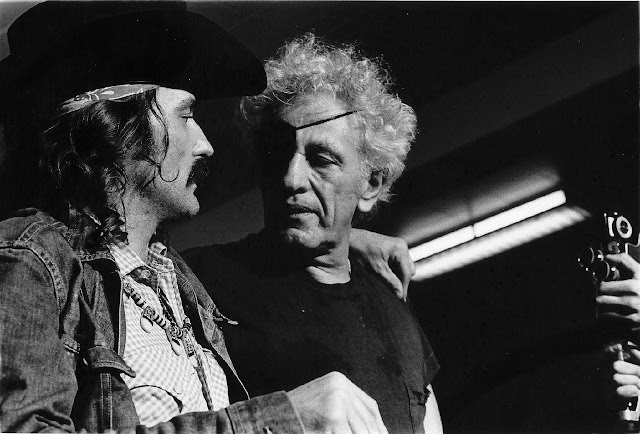 An incredible photograph of Dennis Hopper and director Nicholas Ray (Rebel Without a Cause, Johnny Guitar). Hopper, who played a minor role in Rebel, was at the time romantically linked to the film's lead actress, Natalie Wood. During production, Wood, then only 16, also became sexually involved with Ray -- who was 27 years her elder. Ray and Hopper remained on bad terms for many years until, as rumor has it, they reunited at a 1970 Grateful Dead show at the Fillmore East and called a truce. 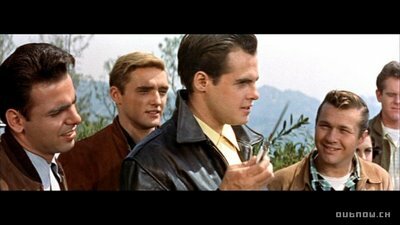 A much younger Dennis Hopper pictured here (second from left) in Rebel Without a Cause (1955). For this edition of Pickin' Videos, where I like to showcase my favorite bluegrass clips found online, I've selected the Seldom Scene performing 'Wait A Minute' on the Tommy Hunter Show, taped for the Canadian Broadcast Company. The Seldom Scene formed in 1971 in Bethesda, MD, in the basement of banjo player Ben Eldridge. They went on to become world famous in the bluegrass community and have undoubtedly influenced many bluegrass groups that came after them. Listening to this clip and others by the band, you will hear modern bluegrass heavyweights Alison Krauss and Union Station, Newgrass Revival, and Old Crowe Medicine Show. Eldridge still performs in the band today, 39 years after their formation in his basement. Living not too far from Bethesda and The Birchmere music venue in Alexandria, VA, their home base for many years, I have been able to find a number of their records at my local vinyl shop, and they sound amazing on the record player. Next month, at the aforementioned Birchmere, founding Seldom Scene member John Starling will be performing with Union Station's Dan Tyminski and his son Jay Starling. Coincidentally Jay Starling performed at The Birchmere just two nights ago as a member of Keller Williams' band The Added Bonus. This clip of 'Wait A Minute' epitomizes not only what I love about the best bluegrass music, but more generally what I love about all music. You get the purity of acoustic instrumentation, a high level of musicianship, and perfectly blended vocal harmonies. You also get a glimpse into the band's sense of humor following their performance. But, we still love ya Bobby!